Though not strictly Tau related, I did put my R'varna in a couple of the pictures. That counts right? 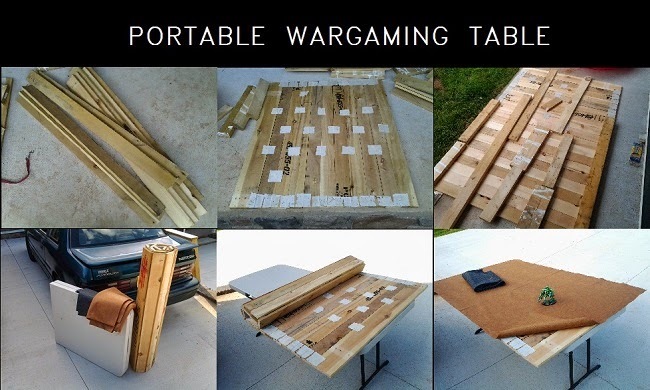 There aren't very many options out there for portable wargaming tables. Those that are out there all have their own flaws and my design is an alternative method for those of us who are limited in everything except willpower. No money? No time? No space? No problem. This tutorial is not meant to be a strict step-by-step. It is intended to get your creative juices flowing and thinking about how you can make your own with what you have available following the same rough design. In theory, this tutorial should have something of value for just about anyone, regardless of their resources or handyman skills. First, why should you build this way instead of another? Only you can answer that. I used this design because it addressed a few problems that I had with the existing portable table designs out there, even if it had new problems of its own. Very cheap-If you already have the tools and a base table available(most people will I think), you could potentially make this board for free. 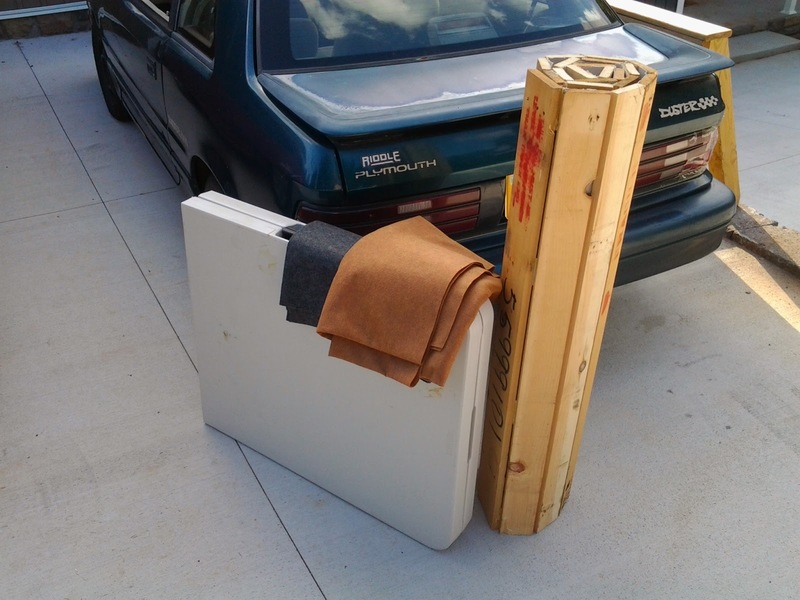 Simple to move-The cloth hinge design allows you to pack, move, and unpack this board all in one go. Instead of several trips to your car with segments and pieces. Quick & easy to build- there's no need for special skills, power tools or exact measurements to build this. Similarly, it is very easy to fix if something falls apart down the road. 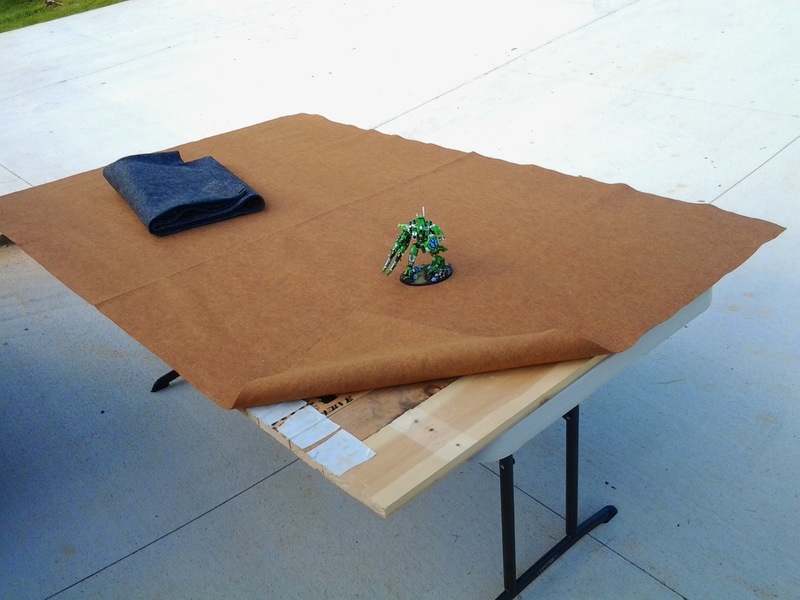 Builds character- If prying boards from a scrap pallet (that you had to ask a store manager for) to make your own wargaming table doesn't build character, I don't know what will. Heavy- The board weighs about 40 lbs (18.5 kg) on its own. Keep your back straight and lift with your legs! Uneven surfaces- The odd board or warping can cause some uneven areas on your board. The gaming surface and good wood selection will make this hardly noticeable, but it won't fix it completely. What do you want from me? The wood is FREE! If the good outweighs the bad to you, then read on. If it doesn't, read on anyways; maybe you'll have some creative revelations of your own. Base table- Wherever you play you'll need a 6' long table. 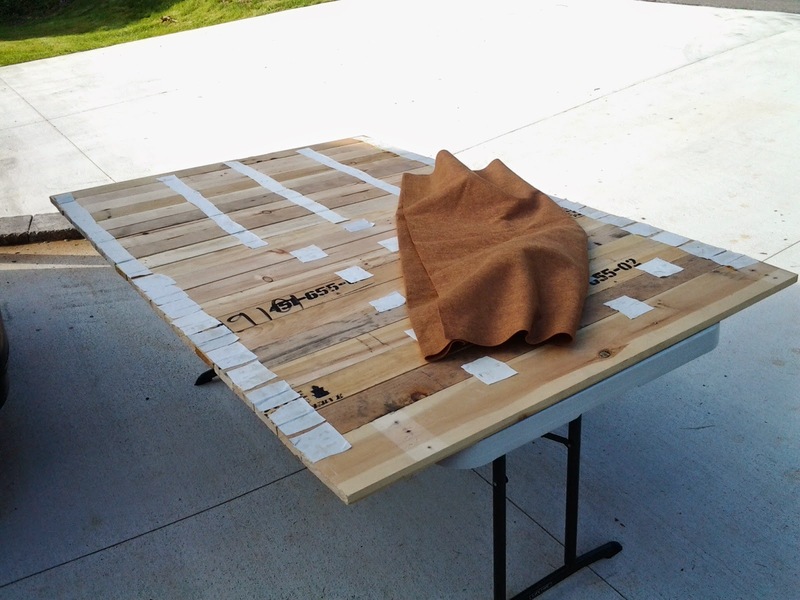 You can also buy a folding 6' table from walmart for about $40 if there aren't any acceptable tables where you play. What you want is 4' lengths of somewhat thin boards. 1" thickness is very easy to come by (3/4" in actuality), but a 1/2" thickness would be better if you can get it. Definitely no bigger than 1" nominal thickness, anything else is too heavy. Less than 1/2" is not very rigid but is doable. 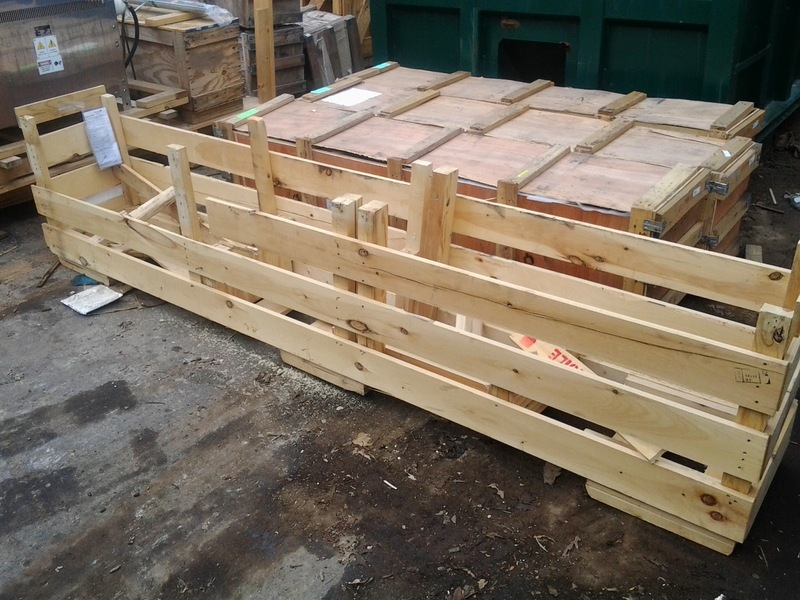 flat wood is best, so shipping crates and pallets work well since they've been nailed down and formed flat. If you can't find full 4' lengths you can combine pieces to reach 4' without any issues (more on that later).You'll want to avoid adding lengths less than 12" since often the joints of those pieces will not be supported by the base table and could be an issue. In my mind, the ideal wood for this project is THIS. It will roll nicer and weigh much less, but buying all you need would be well over $100. The most common wood I've found is 40" lengths of 1x4's from pallets. Most households will already have all of these. If yours doesn't, then you'll need them for getting through Life anyways, so go buy them. You could probably buy this whole list for less than $30 USD. I am lucky enough to work as an engineer for a manufacturing company, and we go through tons of pallets, scrap wood, shipping crates, etc. I found some 1x4 pieces that were over 10' long. I spent 30 minutes during a couple lunch breaks to pry the boards off of the crates and cut them. I also cut one 48" length out of a 1x6 board so I could hit 72" exactly (nineteen 1x4's and one 1x6). I found some scrap cloth that was mostly inelastic and sturdy (some old khakis that don't fit anymore) and I cut it into a bunch of approximate 2"x2" squares. 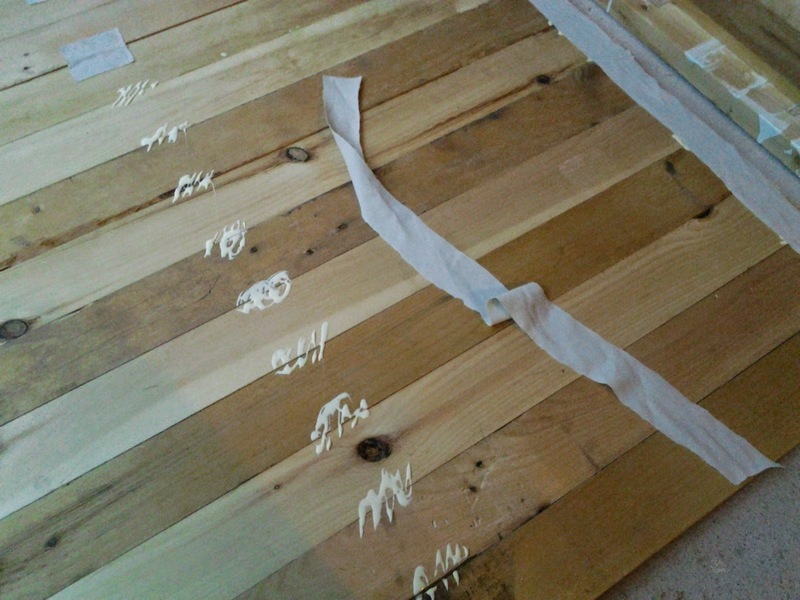 I laid down about half of the wood and glued the squares across the boards. Don't skimp on the glue, apply liberally to try and get as good a hold on the first pass as possible. The more squares you glue on, the stronger it will be. Make sure the cloth gets glued right on the seam to maintain as tight a hinge as possible. For the other half of my board I used long strips along the boards instead of squares, just to see the difference. I'd recommend strips, since it is a bit quicker and gets you the same results. 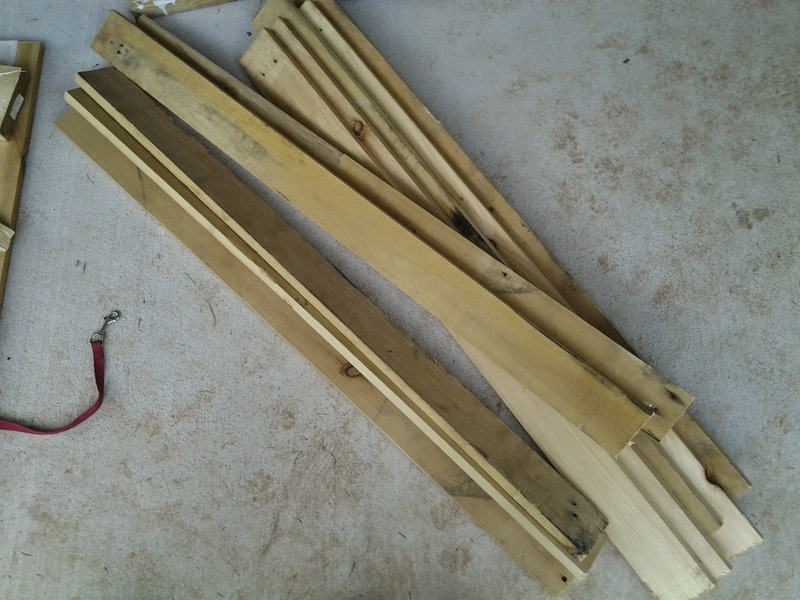 Though you may still want some squares for gluing over large holes in the wood left from knots falling out (you may notice a couple of those in the first picture). Once everything is dry you can try flexing the table. Bend each board individually to see how tightly the hinge is holding. If the cloth isn't holding right to the edge of the wood for tight hinge, I recommend adding more glue and letting it dry again. Each time you make a pass of gluing, let it dry overnight, preferably with something pressing it down (like a few spare 2x4's). Now is when you'll decide if you want to add more rows of hinges or not. I used five rows of hinges on the second half of my board, but I bet three or even two rows would do the trick. When the hinges seem to be holding well and tight, then your table is done! Roll it up, put it on the base table, unroll it, cover it with your gaming surface and you are good to game! Cost- $0.00+. For my gaming surface, I spent $8 USD on two sheets of felt from Joann's. Everything else I either scrounged or already had on hand. Time- Working during lunch breaks and after the kids went to bed, it took me about 4 hours of work spread over 3 days, including 2 nights/workdays for letting glue set. If I were to do it again I bet I could do the whole thing in less than 2 hours with one night of letting the glue dry. These are the specs for my own board, ymmv depending on the materials you choose and what you have on hand. Now, something for those of you who can only find free wood in the form of pallets. I did not execute this method myself, but I planned for it in case pallets were all I could find. Hopefully some people find it useful. 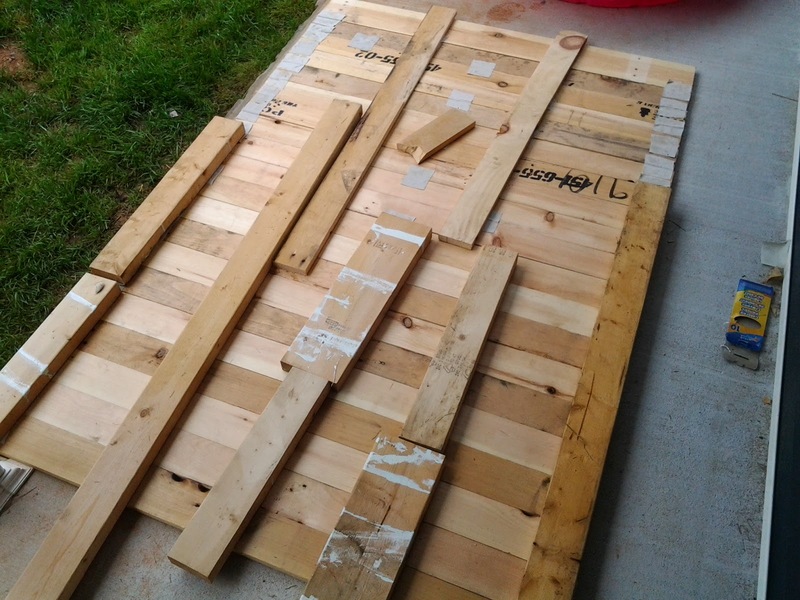 Pallets are an excellent source of free wood. Just about everyone uses them and just about everyone will be glad to give them to you for free. 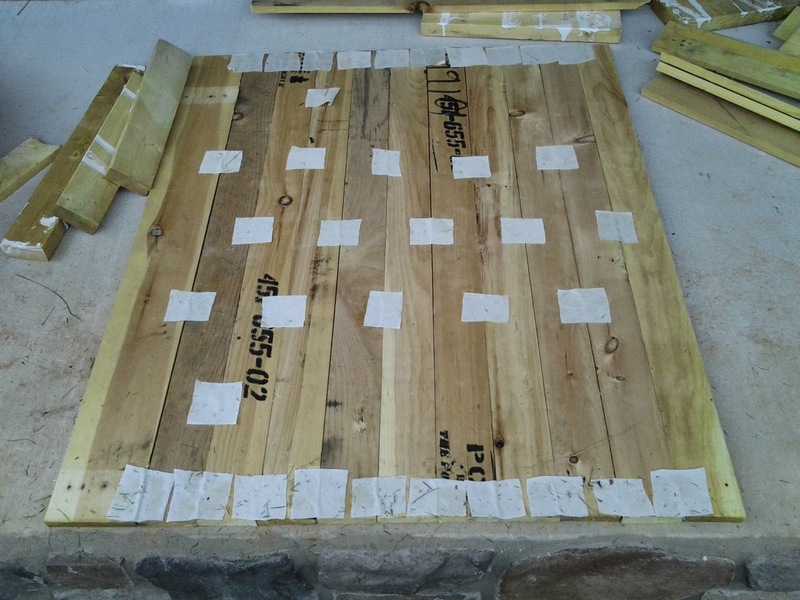 Most pallets have several 1x4 or 1x6 boards on them but they are only 40" long on a standard sized pallet (might be different outside US, not sure). So you have to redistribute the lengths. You start by cutting each 40" board into a 16" length and a 24" length. You can combine two 24" boards into one 48" board, and three 16" boards into another. 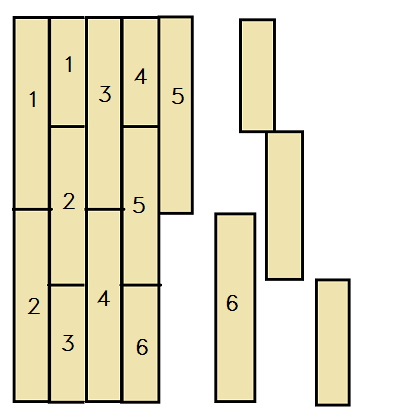 Six 40" boards transforms into five 48" boards. Just keep adding until you have the total length you want. It can be time consuming but the 16" length should keep the joints at least partially supported by the base table. Doing it this way will end up with some extra wasted wood but it was free anyways. 48 1x2's will hit 72" exactly; 21 1x4's will hit 73.5" and 13 1x6's will hit 71.5" (both pretty close). You will want to use extra strips of cloth and glue to make sure everything is properly supported. I'd say you'll need 5 strips minimum. Obviously, finding anything 48" or longer that you can cut down will save you time, but sometimes you have to work with what you've got. 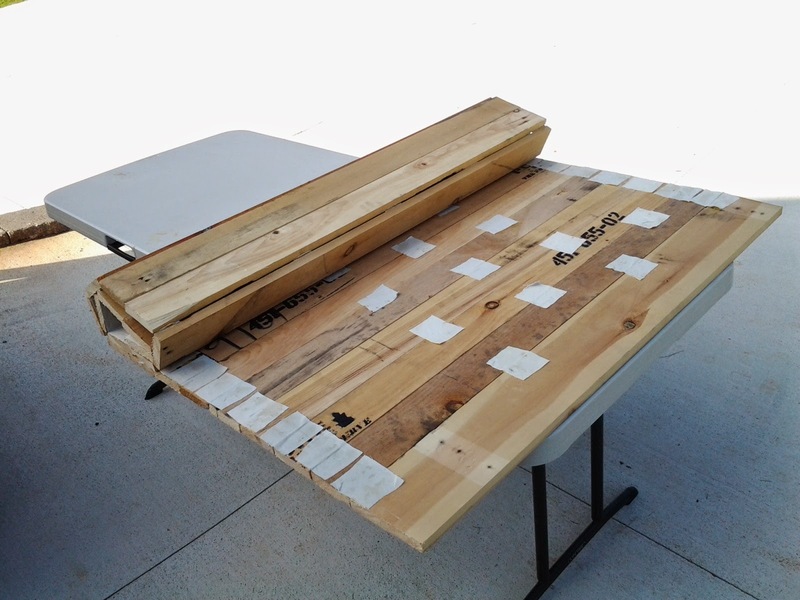 With a little creativity, and some easy math, just about any boards that you can get your hands on will work for this table. Well that's it! Please let me know what you think of my design. It's far from perfect but it gives you an idea of what you can do and how cheaply you can do it! I'll be posting the "advanced" course in a little while to show some of the extra improvements I made to my own table. Genius idea. Thank you kindly! Looks interesting. Weight is a bit an issue since the table is separate so you are making two trips. By buying wood you might be able to find thinner pieces but you cannot make it to light as the table does not support the edges and you do not want a heavy model to tip the table. Weight is definitely the major concern. You dont want to go too thin to maintain strength. And too light makes it that much easier to slip or tip. As far as trips go, there is only one table design i have seen that incorporates everything. It is more labor intensive, is heavier, and costlier so i did mine this way. Looks like a great idea. For improved durability you could use leather or nylon strapping/webbing instead of cloth. Drill holes and fasten with rivets and washers. Should hold up forever at that point. I have already added staples to the hinges for added support. And I am in the process of drilling 3/4" holes throughout the wood to reduce the weight. We'll see how that goes. Instead of using strips, you just used one big piece of felt which is also the gaming surface. I considered that, and I'm sure it is possible. I decided against it for a few reasons. Mostly I just did it my way for #2, to save glue. I see no reason why it wouldn't work though, somebody should try it! 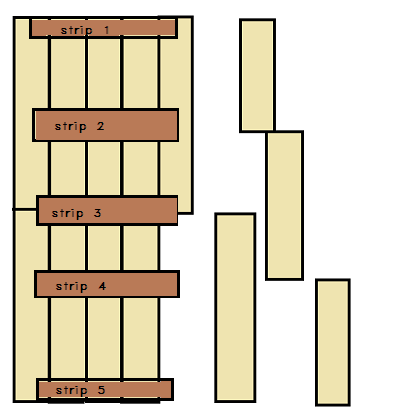 If you cut the strips so it would have hinges on alternate sides per plank it would be able to fold up much tighter into a rectangle opposed to a coil.